Where could you use idioms in exams and why? *Writing: FCE/CAE/CPE, in the case of informal letters (they rock!!! ), in reviews and in some articles and essays ,depending on the topic and level of informality of the idiom. Because some idioms seem more neutral than others. And other idioms may sound really offensive and superficial if used in academic writing. WHEN THE GOING GETS TOUGH, THE TOUGH GET GOING=when faced with a difficulty/danger, strong people take action. 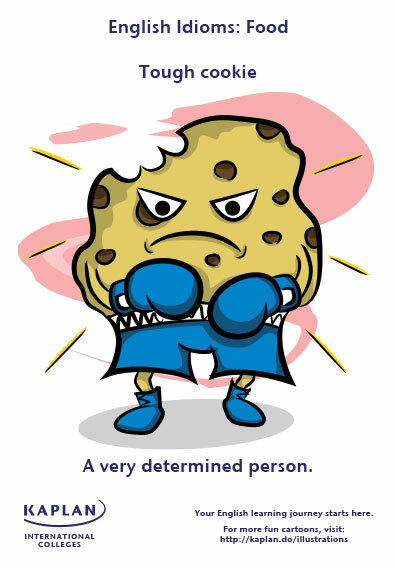 So, if you’re A TOUGH COOKIE, learn as many idioms as you can and insert them in your discourse, you will STAND HEAD AND SHOULDERS ABOVE the other candidates. For a useful list of idioms, contact me and I will send it via email. Using idioms will become EASY PEASY LEMON SQUEEZY.